I’ve said it a million times, and I’ll say it again: I’m a huge fan of cashmere, and firmly believe that every girl should have a wide variety of the super soft wool in her wardrobe. Especially on a day like today, when fall is in full force and the air is whipping a cold, crisp wind, it becomes pretty clear to me — and hopefully does to you, too — that cashmere is an essential element for a healthy clothes closet. The proof is in the pudding: Check this gorgeous wrap-front cashmere sweater by DKNY. Sophisticated enough for work, but soft enough for cozy comfort, this DKNY cashmere sweater would wear wonderful over your favourite tights or skinnies. The relaxed fit, draped wrap front, and banded bottom and cuffs are exquisitely designed to fit your body shape almost perfect. It’s luxury in a knit, people. Really. Markus Lupfer has won several awards for his ground-breaking work with textures and fabrics. Perhaps most recognized for the graphic embellishments he uses in his designs, Lupfer’s print emrboidery shirts and dresses have established him with quite the cult of celebrity fans (Daisy Lowe and Lily Allen just to name two). My favourites from his striking sequined sheaths? See above. What’s not to love about the designer’s ‘Oh You Pretty Thing’ sequin embellished merino wool sweater, ‘Classic’ appliqué scoop-neck jersey dress, and ‘Luxe’ embellished cotton t-shirt? Markus Lupfer covers the gamut of my favourite girly slogans, and though I’ve never been one to style too much graphic anything, there’s a soft spot in my heart for these dresses, t-shirts, and sweaters. Ranging in price from 160 to 380, some may find Markus Lupfer clothing to be more pricey than practical, but regardless, the black-and-white heavy designs are certainly nice to look at. I Love, love, LOVE cashmere. Pretty sure I’d wear it 365 days a year if I could. And while I’ve got a sweater in almost every style – from cardigans, to jackets, to hoodies, – I’m especially loving this unique piece by CO2 cashmere. From the front it looks like a classic three-quarter sleeve sweater, but turn around and you’ll see what gives this scoop-neck top some serious edge. Eight ties create a super-cute cut-out effect. The look is flirty for spring and summer, but right now in the cool spring air I’m wearing it with a tank underneath. In the warmer months, definitely dare to bare your back and highlight some skin – whether you pair this top with a skirt or skinnies, or wear it as a cover-up top over your favourite bikini. The best part? Right now to April 30th, HopeRobertson.com readers enjoy 30% off their purchase at CO2 Cashmere. Just enter code hoperobertson at the checkout. I’ve got my eye on these luxurious lounge pants. Et tu? Can we just talk for a second about J.Crew’s absolutely luxurious cashmere? Check this cashmere shawl popover. Perfect for both weekending and work, I absolutely adore this 12-gauge knit. Long sleeves, shawl collar, and ribbed hem, this sweater is an essential for every woman’s wardrobe. While I prefer basics like grey, black, and white, this sweater is available in every color from jalapeno to dark poppy. I’m thinking a leopard-print coat by Dior that’s more fresh than spring flowers, and French Sole ballet shoes that are perfect for skipping down snow-free streets are exactly what we need to throw a little spice into our mid-winter lives. 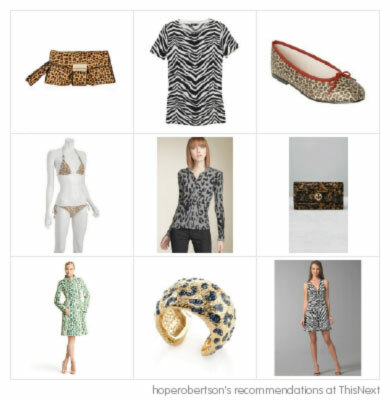 Head over to ThisNext and check out my other animal-print picks, and do tell me if you see something you like! By no means am I a Juicy girl. But I adore this chunky tunic sweater for its unique shape, cowl neck, and cable-knit pattern. All practicality over tights or jeans, and at almost half its original price, wearing it you’d never know it to be a Juicy Couture product. Three-quarter length sleeves, a rolled hem, and a square neck make it unique casual chic for everyday wear. 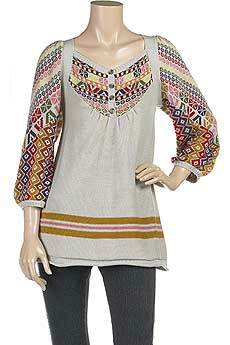 Bright multi-colours and a soft cotton knit make it a splendid choice for Spring, Summer, and even Fall. Available via Net-A-Porter.com for $348.00. This crocheted piece does double-duty for your wardrobe, acting as both a cropped cardi and a jacket. Pair it with a fitted top or a scoopneck shell.